Are you lucky enough to have fresh-caught mangrove snapper and looking for a recipe to prepare it? I LOVE fish tacos and I could not wait to cook up a batch with fresh mangrove snapper caught during my July fishing charter with Capt. Rachael Reynolds of R&R Charters in Daytona Beach. 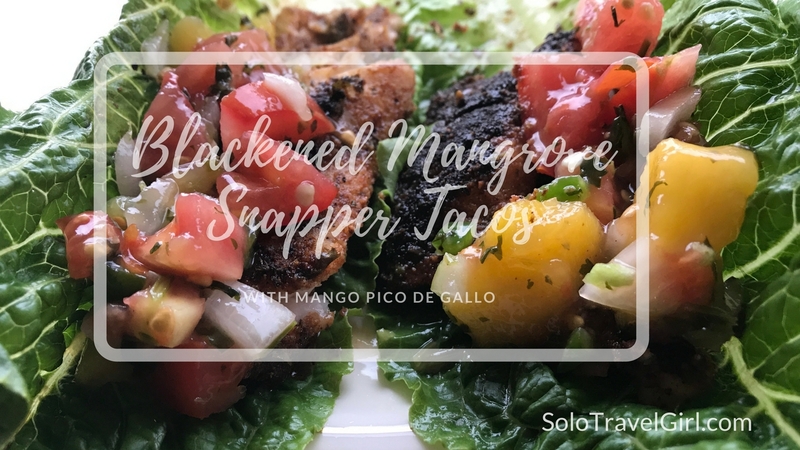 Combined tomato, mango, onion, jalapeno and cilantro together then set aside (in fact, make it the night prior and let it set in the refrigerator to enhance the flavors). In a medium skillet (I prefer a cast iron skillet), heat the olive oil. Slice the fillets into 1″ strips. Place blackened seasoning in a bowl and roll the mangrove snapper fillets in the seasoning. Pan-fry in the skillet until the fish are a nice white, flakey texture. Place two to three strips in a romaine lettuce leaf, like a taco. Squeeze fresh lime or a drop or two of lime essential oil on the fish. Top with the mango pico de gallo. How do you like to prepare your fresh catch?